South Carolina police have released the identity of the suspect in the church shooting Wednesday night as Dylann Storm Roof, 21. Local media report he was arrested Thursday morning. A law enforcement source told WLTX that Roof has been arrested in Shelby, North Carolina, almost 250 miles (400 km) - about three and a half hours' drive - away from Charleston. The arrest was reported shortly after shortly after 11 am local time, and confirmed by US Attorney General Loretta Lynch at a press conference. Charleston police chief Greg Mullen said that local police stopped the suspect's car after a citizen called in about "suspicious activity." Mullen said the suspect was "cooperative" with the officer who stopped him. The gunman had attacked parishioners at Charleston's historic Emanuel African Methodist Episcopal Church, killing 9 people. Witnesses say the suspect attended a prayer meeting for an hour, before he began shooting. Three men and six women were killed. There were three survivors. 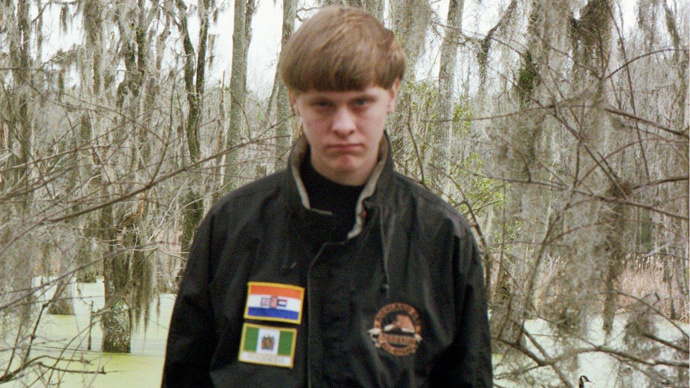 A Facebook photo shows Roof wearing a jacket with two flag patches: one of Apartheid-era South Africa, and the other of Rhodesia, before it became majority-ruled Zimbabwe. Roof’s uncle, Carson Cowles, told Reuters in a phone interview that the 21-year-old received a .45-caliber handgun as a birthday present from his father in April. Arrest records indicate that Roof was detained on charges of felony drug possession in March, and misdemeanor trespassing in April of this year. He had no prior criminal record. Roof lived in in Lexington, SC, about 120 miles northwest of Charleston, where he attended White Knoll High School. "I did have a couple classes with the guy in middle and high school," tweeted Lexington resident Kimberly Taylor, "But he wasn't my best friend or someone I kept in contact with." His MySpace page contains only a music track from the Christian death metal band "A Thousand Times Repent." The FBI, the Bureau of Alcohol, Tobacco, Firearms and Explosives and several other agencies have joined in the manhunt, police chief Gregory Mullen said. According to the police, six women and three men were killed in the shooting, including Reverend Clementa Pinckney, the church's pastor, who was a Democratic member of the State Senate. Eight people were killed inside the church and one more died at the hospital soon after the incident. Three people survived the attack, although police have not revealed their identities yet. The president of the Charleston NAACP, Dot Scott, said the gunman told one survivor he would let her live so that she would tell others what happened in the church, local newspaper The Post and Courier reported. Early Thursday, Charleston police released photos of the suspect as well as of the black sedan car he was leaving in, obtained from security cameras. According to police chief Gregory Mullen, the suspect is a clean-shaven white man with sandy blond hair and slender build, who was wearing a gray sweatshirt with blue jeans and Timberland boots.